The education system has changed its way of punishing students. If there is a problem now, the students go to court. But its not a normal court, its made out of students and preschoolers. Attorneys , prosecutors and judges are all students. Follow the case of Tento Nanahoshi as he and his attorney Abaku Inugami try to prevail the accusations of murdering the pet fish of the class. It will be a though process as the prosecutor is the cute and rich Pine Hanzuki. 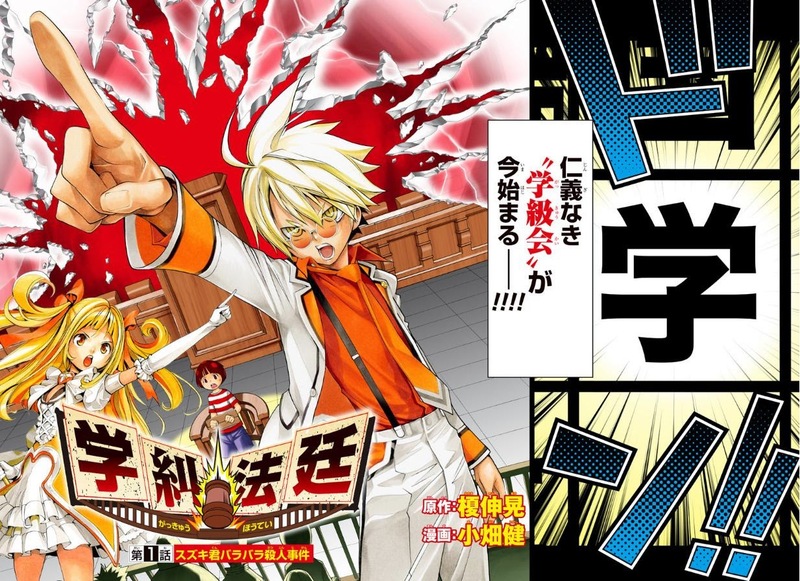 Gakkyuu Houtei by author Nobuaki Enoki and artist Takeshi Obata began in issue 1 of the 2015 Weekly Shonen Jump editions. Obata is a very well known artist, who is accredited for works such as Death Note and Bakuman. His artwork is as incredible in this series as it was in his previous works. The main plot idea in Gakkyuu Houtei is quite new and will have to prove itself to readers. Our main two characters have very colourful personalities which will help to carry this series. There was little humour in the first chapter but it is something that Enoki can work on. Overall, this is a type of series that has not been seen in Jump in a long time. Gaining popularity may be difficult but as Obata is doing the art, he may draw in a larger audience.